Used on all *nix based systems. 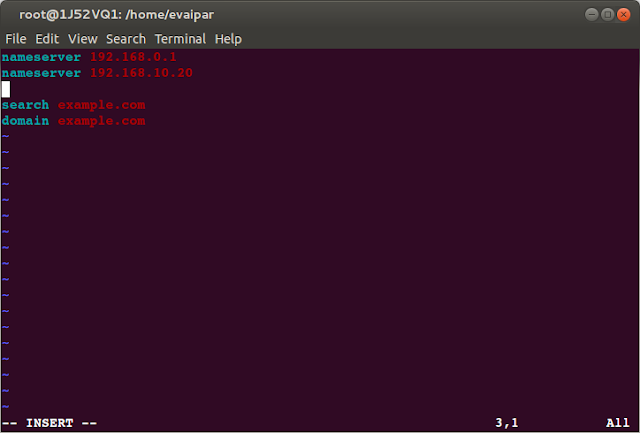 DNS client resolver lookup file. It can be auto configured, only if you are using DHCP – dhclient command. It can be configured manually as well. ll /etc/resolv.conf > size of file is 81 bytes when your system is acting as a dhcp client. In case you find the size bigger or smaller and your m/c is acting as a dhcp client,that means your file has been tampered in some way. This is the domain name that will be automatically appended to client names if I am not using fqdn and using only the short names. This is the ip address of the main dns server to consult. Some malwares are found to remove the original dns server and replace it with fake dns server ip. So, you will get undesired result. Some malwares are also found not to replace your dns server ip but they will append some fake dns server as primary dns server and make your dns server second choice. By default, except the browsers, all dns clients applications (dig, nslookup) will bypass the /etc/hosts file and use only the /etc/resolv.conf .i.e. only your web browsers will consult the /etc/hosts file.